This is another of my Joseph's Coat variations. This time I used the Swirly Bird stamp set. 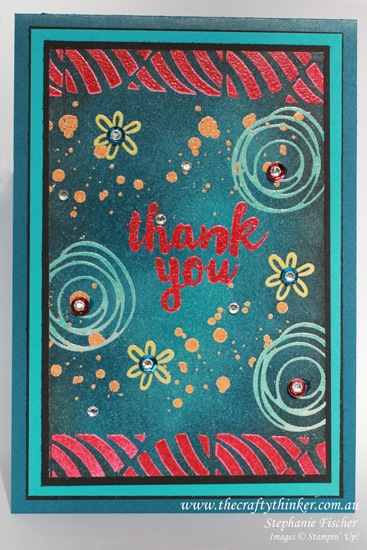 Swirly Birds is such a versatile stamp set! The greeting is from the stamps included with the Oh Happy Day Kit. It actually says "Why Thank You". Whilst we all know what that greeting is trying to convey, I do find it botheringly ambiguous - so I simply omit the word "why". To do that, I cover the "why" with some washi tape before I ink up the stamp and then remove the washi tape before I stamp. I added sequins and Basic Rhinestones to the finished panel. I decided to leave the centre of the card a little lighter, so I used Tempting Turquoise ink , blending it into the Dapper Denim that I used over the rest of the panel. I added a light touch of Memento Tuxedo Black ink to the edges of the panel. Basic Black: 3 9/16" x 5 5/16"
Tempting Turquoise: 3 1/2" x 5 1/4"
Basic Black: 3 1/4" x 5"
Joseph's Coat panel: 3 1/8" x 4 3/4"
Wipe the entire Whisper White panel with an Embossing Panel to remove oils and static. Using the striped sail shape, coat well with Versamark ink and then tap into Melon Mambo ink. Stamp horizontally at the bottom of the panel. Sprinkle with clear embossing powder. Repeat at the other end of the panel. 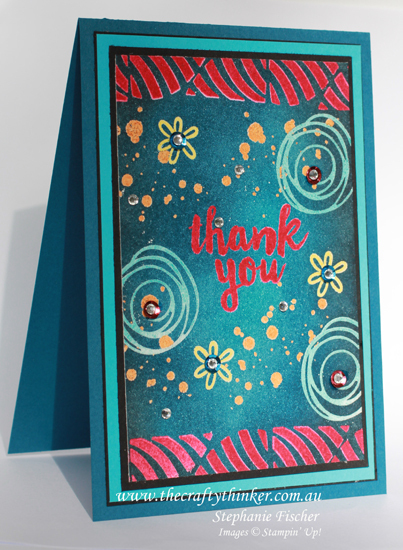 Use a similar process with one of the swirls, versamark and Tempting Turquoise ink. Repeat with the little flower, Versamark and Daffodil Delight ink. Repeat with the ink splotch stamp, Versamark and Peakaboo Peach ink. Allow to cool for a minute or two. Use a tissue to remove the ink from the embossing. Keep to hand a damp cloth (to clean the stamps) and your clear embossing powder. When using coloured ink, always clean and dry the stamps between uses so that you don't transfer ink to your Versamark ink pad. I prefer to sprinkle the embossing powder soon after stamping the image, so I sprinkled the embossing powder before changing to a different stamp or colour. Photopolymer stamps are the best for this process because you can see exactly where you're stamping. The zig-zag stamp I used is rubber (one of the Clear stamp sets) so I used it first. I personally would only use a photopolymer greeting because I wouldn't have the courage to try to line up a rubber greeting stamp without the use of a Stamp-A-Ma-Jig - which would not be feasible. I didn't worry about overlapping the Peakaboo Ink Splotches over the Tempting Turquoise swirls.